Legal Sea Foods cooked Jumbo Shrimp are processed by peeling and cleaning fresh white shrimp, leaving the last tail segment attached. They are then cooked, frozen individually, packaged in a re-sealable bag, and then sealed inside a box for maximum protection of product integrity. Legal Sea Foods Gourmet Breaded Butterfly Shrimp are processed by peeling and cleaning fresh white shrimp, leaving the last tail segment attached. They are then coated with flavorful batter and then dusted with a light coating of seasonal Japanese style "Panko" breadcrumbs. 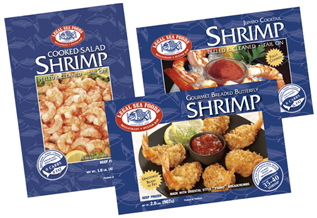 Legal Sea Foods Cooked Salad Shrimp are processed by peeling and cleaning fresh white shrimp. They are then cooked, frozen individually, packaged in a re-sealable bag for your consumer convenience.